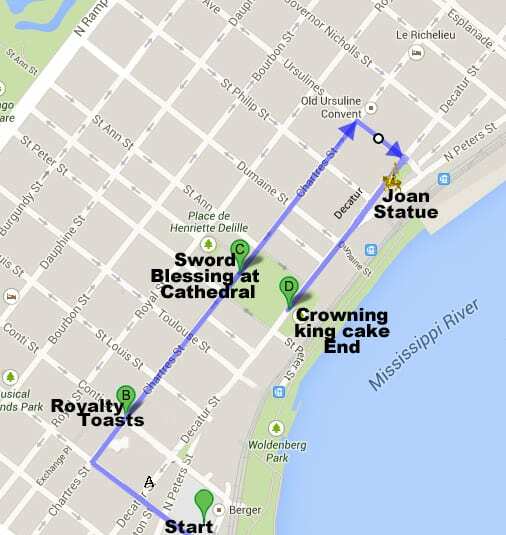 Route map of the 11th annual Joan of Arc parade Sunday January 6, 2019 at 7 p.m. Note change in starting point to Bienville and N. Front. the crowning of the king and king cake ceremony at the end at Washington Artillery Park. Bring your own king cake to eat your first king cake along with the king and Joan. Suggested best parking: Premium Parking Lot 402 (map, reserve). Public restrooms will be open in the Canal Place and Jax Brewery shopping malls before the parade.